En Rama Manzanilla "I Think"
Sherry seems to be going through a mini-renaissance right now, after decades of being banished to the backwater of granny’s christmas cupboard. It is after all one of the few real bargains of the wine world – complex, characterful, consistent and often aged for a decade or more, yet entry level examples in most styles can be had for under a tenner. Many of us who fancy ourselves as tastemongers or connoisseurs are familiar enough with the key concepts – a refreshing fino or manzanilla makes a delightful aperitif, dry amontillado or oloroso can be amazing food wines, and then there are the luscious, unctuous concoctions made with Pedro Ximenez. Yet in the UK, it’s hard to find anything like the range of sherry producers that we might expect from other wine styles. Lustau flies the quality flag, but is a huge concern. La Gitana is ever reliable, if unexciting. But what about the smaller, “boutique” producers? The Niepoort Vino Bianco 2009 is a white wine made from Palamino Fino grapes that have been vinified under flor (the distinctive layer of yeast that gives young sherries their acetaldehyde aroma). It’s a curiosity, with the same freshness and bite as a good fino, but without the more alchoholic kick (it’s unfortified). You can however taste that there is not much going on underneath the appealing flor character – Palamino is famed for its dullness, if vinified conventionally. 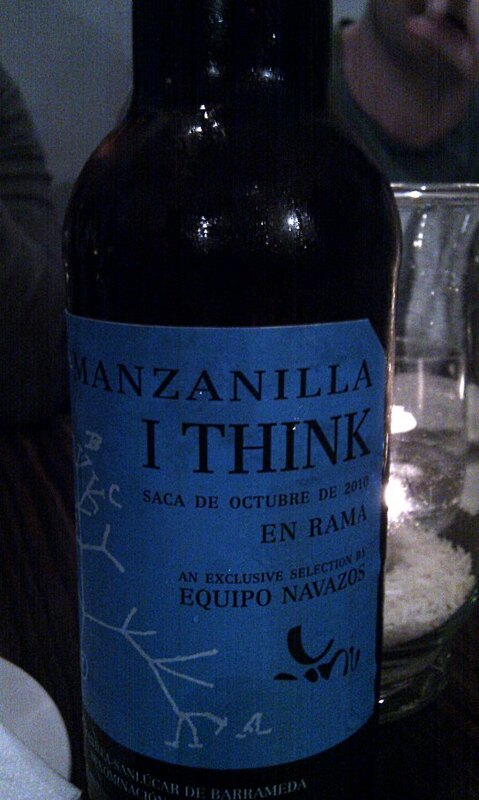 Next up was the En Rama Manzanilla “I Think“, with its characteristic label. This is a wine that Naked Wines used to sell, but interestingly they have delisted it after customer rebellion. My opinion is that this has more to do with the poorly signposted fact that it’s sold by the half bottle than the contents. I liked the slightly oily, viscous texture, and green pepper flavour in amongst the more usual flor notes. Very long in the mouth, too. Now we were ready to get down to serious business with four El Maestro Sierra offerings. All were superlative and truly individual, in a way that most large-production sherries are not. The Fino, aged for four years before release, was again quite weightily textured, with candied peel on the nose. The finish was very fine and long. The star of the show was definitely the Amontillado, with fantastically complex and rewarding notes of burnt rubber, cocoa beans, dried fruit and more. The Oloroso showed freshness, walnuts and caramel, plus a gorgeous velvety texture, but couldn’t match the multi-facatedness of the Amontilldo – it seemed oddly closed in comparison. Finally, the Pedro Ximenez displayed customary richness, and a thick, engine oil texture – but also uncharacteristic freshness, complex chocolate, tar and citrus peel flavours and an appealing green character on the nose. I haven’t yet mentioned the carefully chosen and delectable tapas that were served with each wine – the highlights were mussels with Serrano ham, seared tuna with fennel and orange (perfect with the fino or the amontillado), barbary duck breast with honey glazed figs and braised rabbit with lemon, mint and Manzanilla olives. 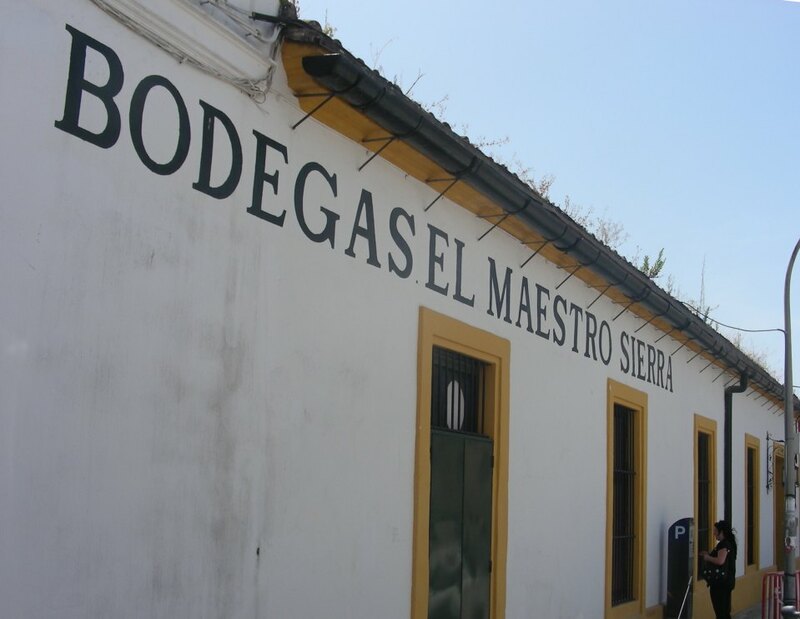 The El Maestro Sierra wines are superlative examples of the classic sherry styles, with outstanding freshness and personality. Yes, they will set you back a bit more than La Gitana or Tio Pepe (especially the Amontillado at £17 for a half bottle) – but they are still excellent value given the quality. I believe they should now be on the lists at both Green and Blue and Number 22 – reason enough to move to South East London! All good stuff indeed. And you’re quite right re the food too, it was grand. 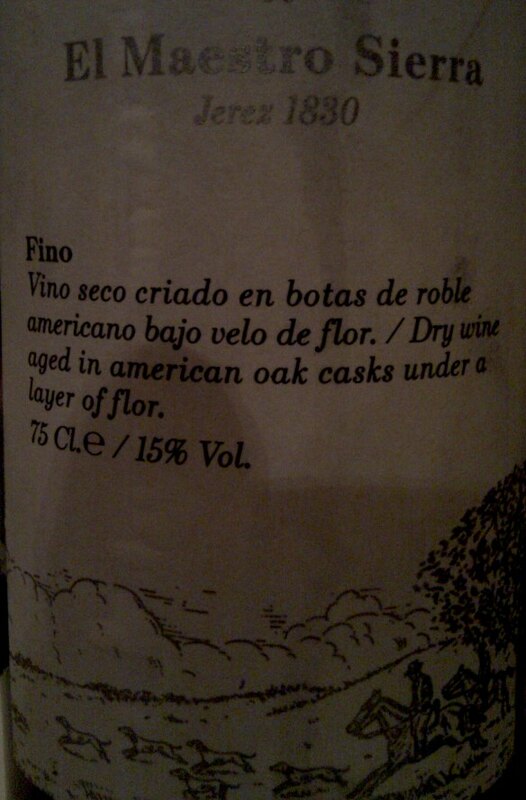 I do need some of that amontillado in my house! Great post. Nice to read the Maestro Sierra are getting into the UK. BTW flor is yeast, not bacteria. Hi Simon, thanks for the write up. It was a pleasure to host such a keen and well educated group as your lot! I have completely fallen in love with that Amontillado which is possibly in my top 10 wines ever! Hey Olly, thank you, was a most enjoyable evening, and I’m definitely going to take you up on the offer of putting together a case of the weird and wonderful, from Indigo’s list . . .
And what a treat that was thanks Olly!! I’m still blabbbering about it..I’m so pleased you did this post too Simon. I won’t bother pretending to take notes next time!